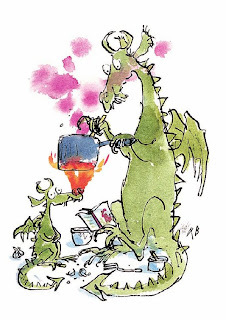 In honor of National Poetry Month and my son whom I inadvertently named after this man, I decided to delve into some poems by Ogden Nash , selected and illustrated by Quentin Blake. Very much along the lines of Shel Silverstein of Where the Sidewalk Ends fame, Nash's genius is fun and wonderfully unadorned. At the time of his death in 1971, the New York Times said his "droll verse with its unconventional rhymes made him the country's best-known producer of humorous poetry". I had a lot of fun reading this book. It made me want to try it myself - ha. I'd prefer someone else to fill in the blanks instead, or better yet write your own and include it in the comments. Happy poetry month! Now I'm all wide and oh so ________. Make me grateful for my big ______. the man was a wordplay genius, and inspired me to come up with a rhyme for the (theoretically) un-rhymable word "purple". I'm sure that my burp'll." LOL I'm peeing my pants that was so awesome! Just now you came up with that? Dang you're good. It won't be hard, his stuff is in a LOT of books. Prepare to giggle much!